Perhaps you’ve been told pictures are worth a thousand words. And, how visuals are favored on social networking platforms. At times you may feel at a loss for how to use them or the myriad of ways they can be incorporated into your social media marketing efforts. 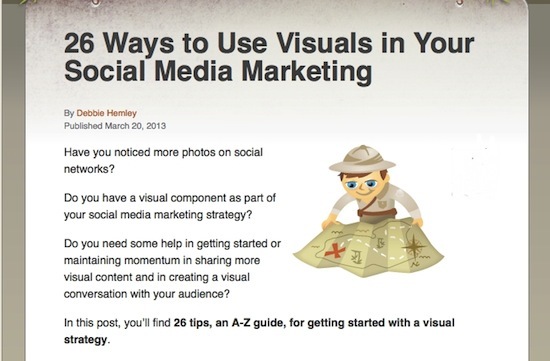 Today, I have a new article on Social Media Examiner, 26 Ways to Use Visuals in Your Social Media Marketing. You can read the full post there. If you’ve found your way to my blog as a result of the article, welcome and thanks for stopping by. You may want to check out my portfolio. Feel free to drop me a line in the comments below or via the contact form. Next Next post: Why 26?